At First Presbyterian we come from a variety of backgrounds, but we share in following Jesus in our spiritual journey. A typical Sunday worship service includes reading of scripture, a thought-provoking sermon, a children’s sermon, and time for both group and individual prayer and meditation. Worship is enhanced by musical components including an excellent organist, congregational singing of hymns, a very talented adult choir, and a bell choir. 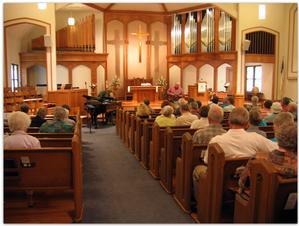 During the summer months special music is performed by soloists or small groups. We celebrate communion of the Lord’s Supper on the first Sunday of each month and at other appropriate occasions throughout the year; all who believe in Jesus Christ as their Lord and Savior, regardless of their formal religious affiliation, are welcome to participate in this most holy sacrament. 220 N. 2nd Ave. E.